JEMDSA 2009 – A firm foundation for the future! As 2009 draws to a close, there is time to reflect on the new-look JEMDSA. 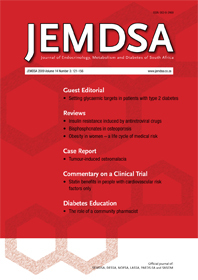 Through the tireless work of Professor Stephen Hough, a new publisher was found and the endocrine community drew together to ensure the success of JEMDSA as the official journal of six societies (SEMDSA, DESSA, NOFSA, SASOM, LASSA, and PAEDS-SA).